A few months into the command of our Regiment at Devlali, Maharashtra, I had an interview scheduled in the afternoon with Naik (Corporal) Ranjit Kumar. My interviews with the soldiers were mostly scheduled in the afternoons as I was a single parent, bringing up our two children aged 11 and five as my wife had already migrated to Canada. As a Commanding Officer I interviewed only those soldiers who proceeded on or returned from courses of instruction, posting in/out and those deputed on some important missions. Ranjith, an accomplished Radio Operator, had been detailed to undergo the Regimental Signal Instructor (RSI) course at Military College of Telecommunication Engineering (MCTE), Mhow. Now, Ranjith was sitting in front of me, at 3 PM, waiting to be spoken to by his Commanding Officer. On speaking with him, I realised that he wanted to attend Long Gunnery Staff Course and getting a good grade at an Army course would enhance his chances of getting selected for the prestigious course. Hence he had put in a special request to be detailed for the course. The problem I visualised for a Naik attending such course is that the solders below the rank of a Havildar (Sergeant) are given many additional tasks like area cleaning, sentry duties, etc at most Army Schools except at the School of Artillery. The common saying amongst the soldiers of our Regiment at that time was that at MCTE and Army School of Mechanical Transport (ASMT), the soldier students are issued with a broom along with their books. While doing the Regimental Signal Officers Course at MCTE in 1985, I have witnessed it as one Naik from our Regiment was attending the RSI course at the same time and in the evenings, he was often seen doing mundane tasks. How to get over this dilemma? I looked at Ranjith for about half a minute and did not utter a word. In effect my mind went blank as I had no solution at hand. I visualised Ranjith spending more time in cleaning the area around and on sentry duties and not getting adequate time to study and do well in the course. I was literally feeling helpless. Eureka! A brainwave stuck me suddenly and I said “Ranjith, I appoint you as an Acting Lance Haviladar. In case you return from the course with an ‘A’ grading, you can continue wearing the rank, else, on termination of the course, return to the unit as a Naik”. 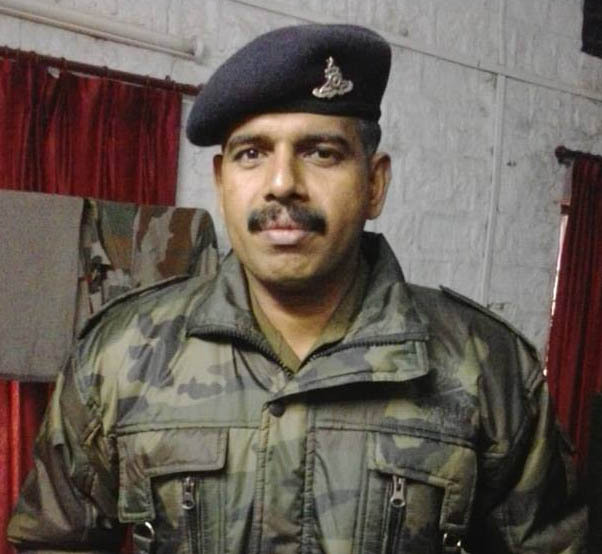 Lance Havildar is an appointment given to a Naik who discharges the duties of a Havildar and in the Indian Army, there is no rank or appointment called Acting Lance Havildar. It was indeed a creation of my mind. The said notional promotion had no effect on his seniority or his pay, but he would wear the rank badge of a Havildar on his right sleeve. A Havildar in the Regiment of Artillery wears a white dot – depicting a bursting shell – in addition to the standard three stripes of a Havildar. It is known among the Gunners as the three and a half stripes. I summoned the duty clerk and ordered all documents – course nominal roll, movement order, last ration certificate etc – to be retyped showing Ranjith as a Lance Havildar. I told Ranjith to take all his uniforms to the Regimental tailor and affix the three and a half stripes on them. After about two months, I got a call from our then Second-in-Command – Late Colonel Suresh Babu – at my home at about 11 AM that Havildar Ranjith has returned from his course not only with an ‘A’ grading, but also has topped the course. I immediately rushed to the office and there I found Havildar Ranjith proudly holding the best student trophy and smiling at me. I called him into my office and complimented him for his achievement. I asked him as to how he achieved such a great result. Ranjith said that the moment he left my office after the interview, he was determined to top the course, come what may. The Havildar stripes ensured that he did not get any of the mundane duties and hence got much more time to study. He would study till late night everyday and after a few hours of sleep, he would wake up to find the three and a half stripes on the uniform staring at him. This made him leave his bed and resume his studies. He did not ever go out of his living lines, even on weekends and never saw any movie. The only entertainment for him was watching the Television while partaking his meals in the dining hall. I asked Ranjith as to why he did not request for his two months annual leave at the end of the course as he would be very tired. He said that he wanted to show to everyone what he had achieved and then only would proceed on annual leave. Ranjith set the trend and many other soldiers of the unit followed suit. In two years, six soldiers from our unit attended the prestigious Long Gunnery Staff Course. In order to repose faith in others, whether its your children or your subordinates; you got to have faith and belief in yourself. If 10% of the managers in India followed this method, their organization would have grown multiple times. Great one Reji , reposing faith is like watering a plant & making it Bloom . Wonderful!! The Three Stripes to Success. in our Battalion one of our company commanders gave the responsibility of a CQMH(COMPANY QUARTERMASTER HAVILDAR) to an Alcoholic and trouble maker Naik, to encourage him to stay away from trouble! The guy took his job very seriously, and did not even go home on Leave for a long time, though we were deployed on counter insurgency in Assam! Then one fine day he broke his resolve and had a drink, and in the evening shot his company JCO for no rhyme or reason, just a psychological burn out in my opinion! Though we have never met, I feel proud of my association with you as a GOLDY. Less than a fortnight back some of our GOLDY friends organised an event in Mumbai to honour the NDA Drill instructor. And now, this interesting story from you. Feels really good to have been part of the Golden Jubilee batch. All the very best! Good One REJI, Out of the box thinking always gets disproportionately high results…. Havildar Ranjith Kumar PV a great soldier retired on 2014 a great friend, a great teacher, a great sportsmen…………. Trust a person and he will return the trust in good measure.